What is an opt-out or unsubscribe rate? An opt-out (or unsubscribe) rate measures the number of email contacts that no longer wish to receive emails from an organization. Organizations can calculate the unsubscribe rate percentage by dividing the number of email addresses who opted-out or unsubscribed by the number of emails delivered. A high unsubscribe rate could mean that e-mail marketing content is not engaging. Organizations seeking a lower unsubscribe rate might want to consider reviewing the copy writing and presentation of calls to action in the email content. How do I check my opt-out rate? Step 1: Click on MY STATS on the left main navigation. 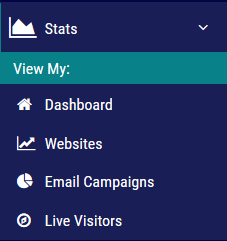 Step 2: Click on the Email Campaigns tab on the top on the Stats section. View the red-orange section entitled Opt-outs for the opt-out rate.